After a haircut down in Clearwater Florida I felt the need for adventurous eating. Adventurous eating wasn't exactly far off from where I was either. In just a few stores down within the plaza I found a restaurant labeled Deeya -- Indian Cuisine. I had to try it for myself. I can't say I am aware of the subtle nuances that is contained in true Indian cuisine but I do consider myself to enjoy adventure outside of comfort zones when it comes to food. It hit me as soon as I came in -- the place was empty. Only the staff were present lonely waiting to serve people. I felt somewhat bad for the restaurant as everyone seemed very friendly right off the bat. I sat down at one of the tables and couldn't help but notice the decor of the place. It wasn't too flamboyant - more reserved in the style with what you would expect to hang off of the walls in a restaurant suited for Indians. I could see flowers hanging off of the walls with little statues of Buddha and various wall hangings that had a classic Indian feel to it. The lighting was dim. Even so dim that the only light I was receiving seemed to be coming off of the sunset. I was almost hoping for a bit more light as I sat down and looked through the menu. I wanted to check how clean the seating arrangement was, looking down at the floor and even digging my finger into the booth cushion to see if I could find imperfection and food stuck between the cushions. To my surprise I could find no discernable dirty area in my viscinity. The menu. It was large. Almost none of the meals were familiar to me. Naming conventions such as Sheekh Kabab, Chicken Korma, Saag, Kadai, Chicken Do Pyaza were flooding the menu. That did not deter me however, as I was interested in a new experience. I needed assistance to help find a dish out of the intimidating menu. The saag was some meat and some spinach that looked like it had been cooking for quite some time. The appearance took me by surprise with its mushy look. I didn't want to leave it without giving the dish a chance though -- so I took a bite. It was delicious. Heavy in flavor. Very heavy. Though the dish tasted gooey and contained bones, the dish itself I could tell had a very Indian feel to it. This is what I was looking for anyway. Adventurous eating. Something I have never tried before and could really take the time to appreciate and gather the various flavors I couldn't hope to try and replicate at home. The chutney going from each color had a very distinct flavor out of each. From the top left was a smokey chili tasting chutney -- very spicy and heavy in flavor. I had to dip some very flat bread with a peculiar aroma from the spices cooked into the flat bread. I'm sorry if I do not know the name of this flat bread -- all I can say is that it had the consistency of a tortilla bubble that has been toasted. Very thin and tasty. 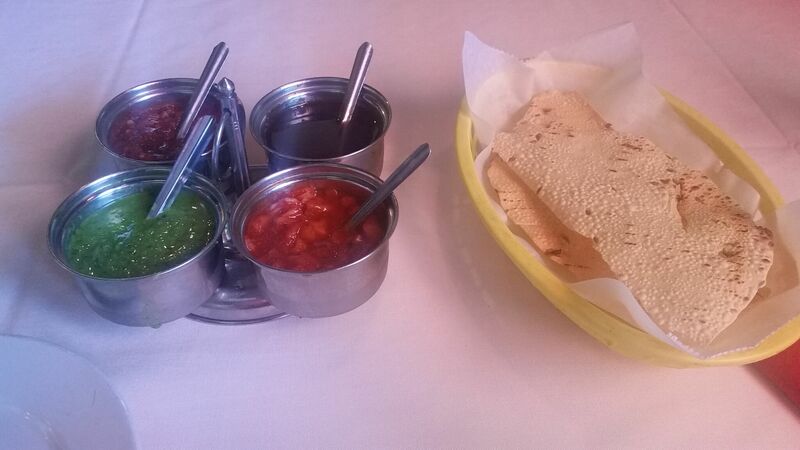 The top right was a tamarind chutney. Sweet, yet spicy at the same time. I could sence a tradition from the chutney and the other dishes to come from it. The bottom right was an 'onion' chutney which was probably spicier and stronger than the others. Though I did not dislike this pungent aroma. I in fact welcomed the adventure. The bottom left -- green chutney reminded me of some sort of mint and cilantro sauce. Similar to a limey sauce you would get for a taco at an authentic Mexican cuisine. All in all the chutney was very appreciated given that it was complimentary and that the flavors were very nice to the palette. It was thick. Mango-ee. Milky and soft. Trying the sweet flavor was very welcoming. I had gulped down the entire drink in less than a minute or two. It was fantastic and yet another adventure different from the others and in its own simplicity, very easy to drink. 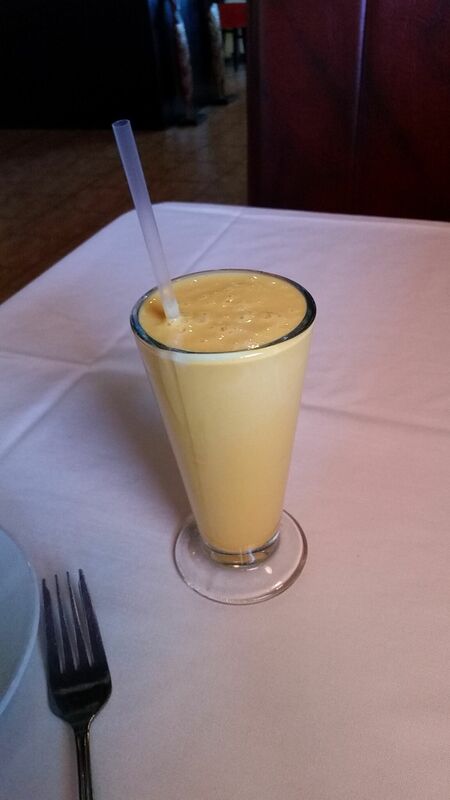 This was one of those drinks that you do not need to convince someone to try even if you were a picky eater. This is something that was simple and to the point -- just as appreciated. 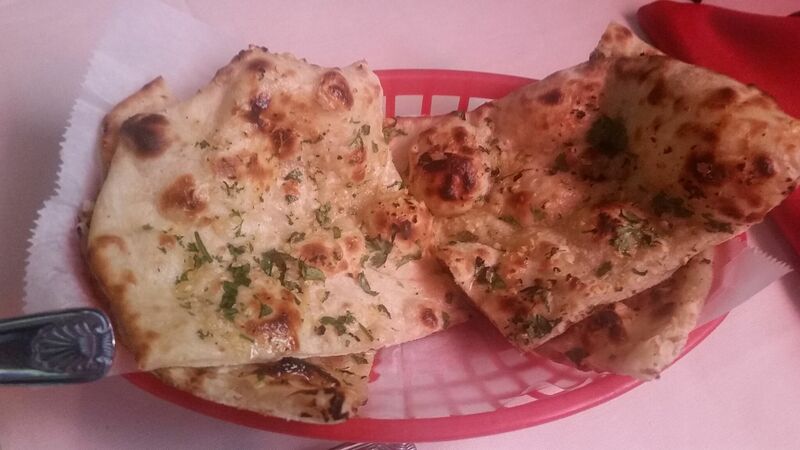 The Naan was a buttery flatbread that had been toasted and given some parsley and heaps of garlic. It tasted similar to what you would find at an Italian pizza place. It was honestly nothing special. But I gave it commendation to its initially unimpressive flavor. During the time of eating my saag and chutney, I found the desire to get myself some water. Maybe even something to help quell the heavy flavors that were blasting through my mouth and that is what this dish did for me. I felt that the blandess became intentional when served with these pungent dishes. Certainly a welcoming piece to the meal. All in all I really enjoyed the meal in its entirety. I can only hope that those who are in the Clearwater Florida area take a stop by this seemingly uninviting cultural feast. For as soon as you walk through those doors, be prepared for some adventure. Very different eating. Great if you are looking for something different or to expand your horizons of Indian cuisine. Strong pungent food vindicative of Indian cuisine. Not afraid to show a clear separation of how Indian cooking is done compared to American cooking. Traditional. Clean establishment. Despite lack of activity it was in good order. Flavors were almost overwhelming. But at the same time, calling Indian cuisine for having too powerful flavors is missing the point entirely. This is subjective. Dish was given in separate metal dishes that were difficult to manage, not sure why you would have one dish and be given 2 separate metal bowls for you to mix yourself. I think we needed a single plate to have for the rice and the Saag. But I don't know, this could have been a traditional thing -- it just seemed odd to me. Slightly more than what it may be worth. At the end of it I found my bill was around $25. Not unreasonable by any means -- but it felt that you would have more butts in those seats at just slightly cheaper prices. Being that there are traditional American restaurants on the same street I feel this restaurant needs to lower its prices slightly to remain competitive. All in all I give this place an 8/10 and totally recommend to anyone looking for an adventurous experience.